South African President Thabo Mbeki has urged Ivory Coast's leader to ensure presidential elections are open to all. Thabo Mbeki's statement read out on television appeared to call for main opposition leader Alassane Ouattara to be allowed to run in the October poll. Rebels in control of the north of the country have made approval of Mr Ouattara's candidature a key demand. Rebels and army commanders are meeting with the aim of relaunching the delayed disarmament process. The Ivory Coast government spokesman said he viewed Mr Mbeki's announcement as a recommendation not a decision. 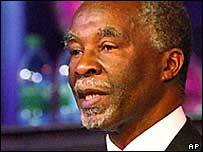 Mr Mbeki was asked by the African Union to mediate between the two sides to try to stop a return to war. Some 10,000 French troops and UN peacekeepers currently patrol a no-weapons buffer zone which separates the rebels from the rest of the country. Although a peace deal was agreed between Ivorian government forces and rebels at the talks in Pretoria last week, the issue of presidential eligibility was not resolved. Mr Ouattara was stopped from running for president in 2000 on the grounds that his parents were not both Ivorian. This is a victory for us and especially a victory for the people of the Ivory Coast. Mr Ouattara's Rally of Republicans (RDR) is popular in the mainly Muslim north of Ivory Coast, which has been under rebel control since September 2002. Ivory Coast's government spokesman Desire Tagro quoted Mr Mbeki's letter as saying that the Ivorian constitutional council - made up of judges - should confirm the eligibility of candidates of political parties that signed the French-brokered peace deal in 2003. That would include the RDR. Mr Mbeki has reportedly called on President Laurent Gbagbo to make the ruling law. The clause on the nationality of presidential candidates is in the constitution and Mr Gbagbo has said in the past he cannot allow the Ivorian constitution to be changed without a referendum, which rebels say cannot be carried out given the present instability. Mr Ouattara's supporters have welcomed Mr Mbeki's ruling. "This is a victory for us and especially a victory for the people of the Ivory Coast. But we're not getting too triumphant. The essential thing for us are the elections," a RDR party official said. In another development, army commander Marcellin Kofi Mbahia has been arrested by armed paramilitary troops at his house for allegedly plotting a coup. "I am a little afraid for my security," he told Reuters news agency by telephone from the police station. He denied the charges, saying he had no power and no troops. In New Zealand, the autopsy of a man who died in rebel custody after they accused him of being a mercenary showed he died not die of natural causes, his family said. However, the autopsy on Brian Hamish Thomas Sands, carried out in the main Ivory Coast city of Abidjan, was inconclusive on whether he committed suicide as claimed by the rebels. His family has said they do not believe he took his own life.